NOTE: 33/130 - Dark Auburn and Fox Red frost is NOT AVAILABLE. PLEASE DO NOT REQUEST this COLOR. 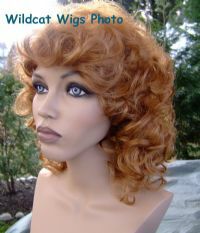 Top quality wig from the Express Yourself Collection of Wig America. This is a mid length style with nice big loose curls and layered. About 17 inches overall. Please allow up to 2 weeks for delivery.